To recreate the flavors at home, I made a batch of pumpkin spice latte muffins. 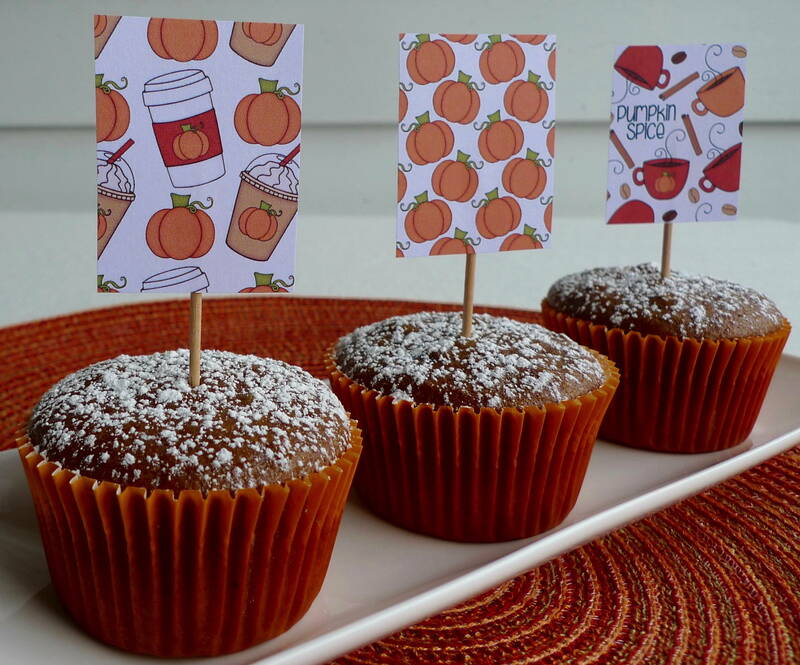 🙂 They are filled with a good bit of pumpkin puree, warm spices, and a generous amount of espresso. 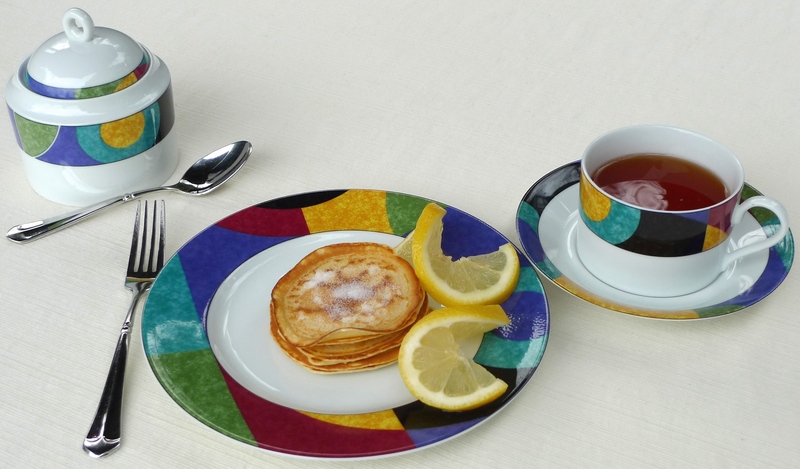 A perfect breakfast treat to start any autumn day. In a large bowl, whisk all of the dry ingredients, from the flour through the salt. In a medium bowl, whisk all of the wet ingredients, from the eggs to the vanilla. Then add the wet mixture to the dry mixture, and whisk until just combined. Take care not to mix the batter too much at this point. Fill your paper liners about 3/4 full. 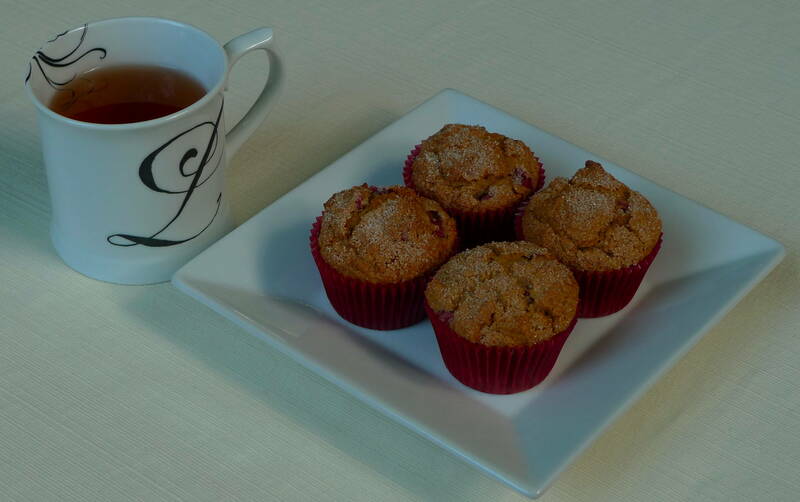 Bake the muffins for about 22 minutes, or until a toothpick inserted into one of the muffins comes out clean. 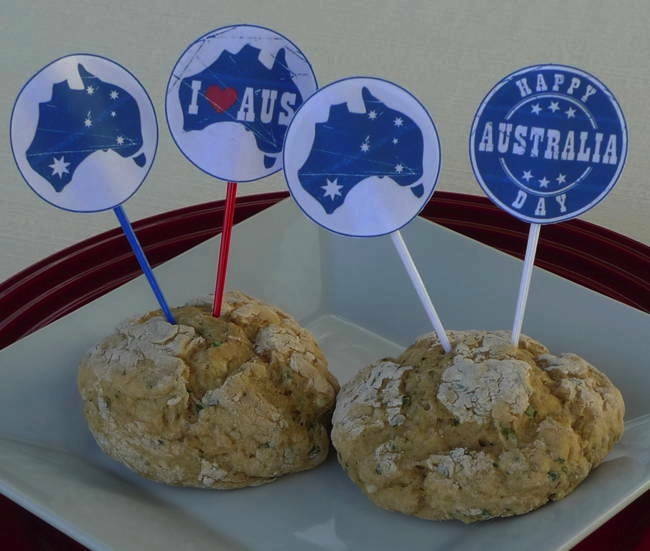 This year I made a couple different Scotch egg recipes to get into the spirit of the holiday. 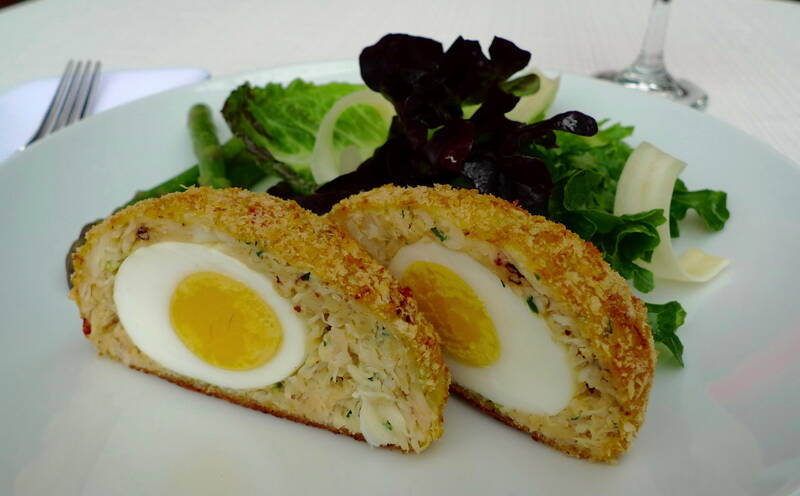 🙂 A traditional Scotch egg is a boiled egg surrounded by pork sausage, breaded, and deep-fried. To make a lighter and more Pacific Northwestern version that also felt like a dish worthy of Easter Sunday, I made crab Scotch eggs. 🙂 Yum! 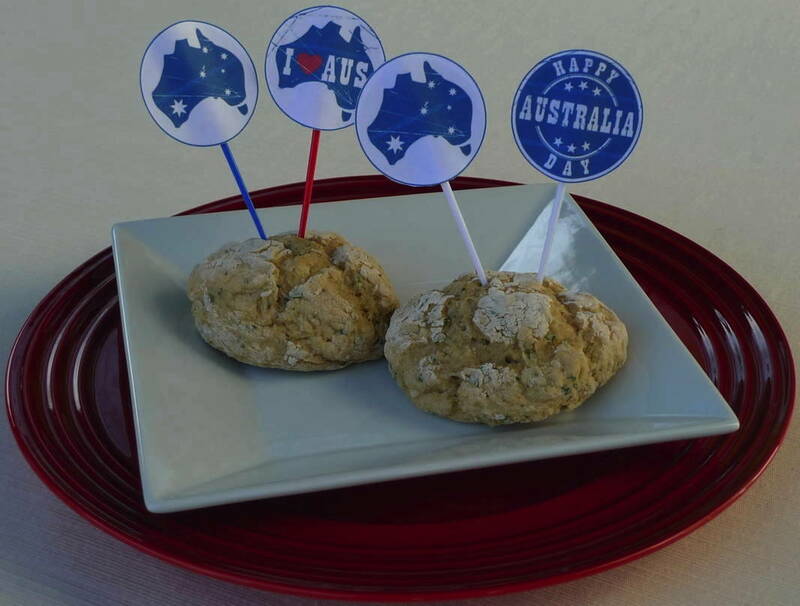 My favorite crab cake recipe transformed (and got a little British!) to make this special dish. I made my Scotch eggs hard-boiled, but I’m sure the molten center of a soft-boiled egg would also be lovely. Preheat your oven to 475 F. Line a sheet pan with parchment paper. Gently place the eggs in a medium saucepan and cover with cold water. Heat the pan over high heat. Once the water starts to boil, cook the eggs for 5 minutes. (Turn the heat down accordingly so the eggs don’t bounce around too much in the boiling water, but make sure the water continues to boil gently.) Remove the eggs immediately after 5 minutes and submerge in an ice water bath to stop the cooking. Peel the eggs. Set aside. Make sure your crab doesn’t have any hidden bits of shell mixed in before you begin. In a large bowl, mix the celery, chives, mayonnaise, egg, mustard, and hot sauce with a fork. Then add the crab and panko. Stir gently until everything is well blended. Shape and gently press the crab mixture around the boiled eggs until they are completely encased. Add the flour, beaten eggs, and panko to three separate shallow bowls. 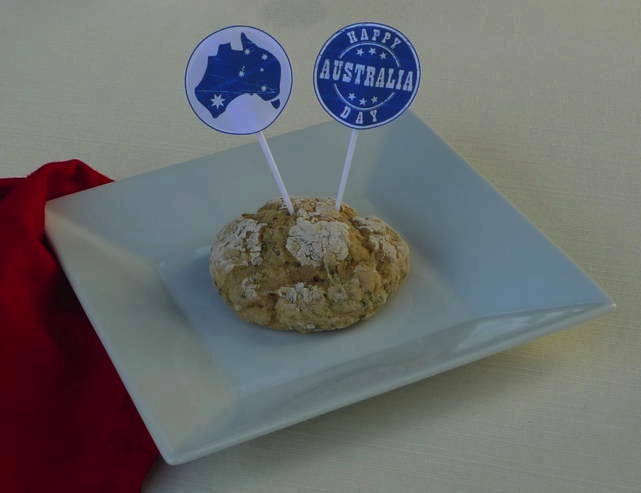 Once the boiled eggs are coated in the crab cake mixture, roll them in the flour, making sure they are completely coated. Gently knock off the excess flour. Then roll the eggs into the beaten egg until they are fully coated. Let the excess beaten egg drip off. Finally, roll the eggs in the panko. Press gently to make sure the crumbs stick. Lay the panko-covered eggs slightly apart on the prepared baking sheet. Bake until lightly golden brown, about 25 minutes. Serve immediately. I wanted to try making a muffin that was 100% fruit sweetened, with no refined sugar. 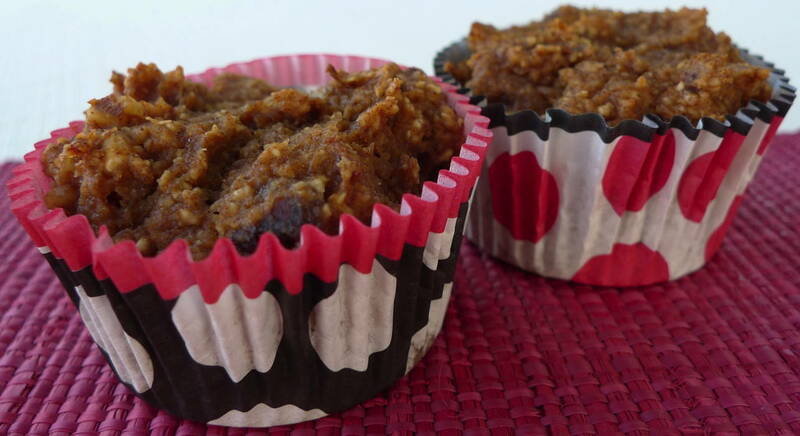 These are sweetened three ways, with dates, applesauce, and a ripe banana. They are also vegan, gluten free, and almost fat free. And I should add, they are quite delicious, which is probably the most important point of all! 😉 If a recipe is super healthy but not very tasty, it doesn’t make the cut for me. 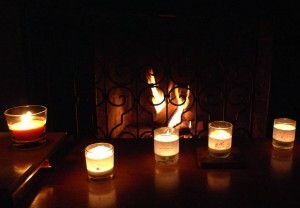 My hubby and I both thought these were pleasantly surprising. (Kind of like our first date! 😉 ) They are concentrated moist sweet morsels, perfect for a quick and hearty breakfast or snack. Preheat oven to 325. Line a muffin tin with 12 paper liners. In a large bowl, whisk together the oat flour, baking powder, cinnamon, ginger, and salt. 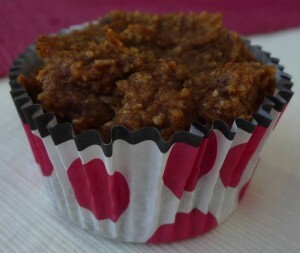 In a food processor, add the dates, applesauce, banana, and vanilla. Process until smooth. Add the wet ingredients to the dry ingredients, and stir until well combined. Add chopped walnuts if you are using them, and stir to distribute evenly. Fill 12 muffin cups evenly with batter. Bake for about 30 minutes, or until a wooden skewer inserted in the middle of one comes out clean. Let cool completely, or they will stick to the paper liners. 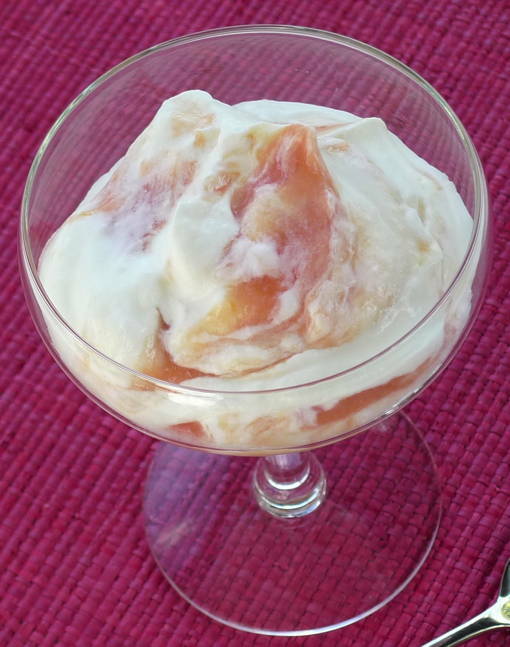 A fool is a blend of cooked and puréed fruit combined with a creamy base. 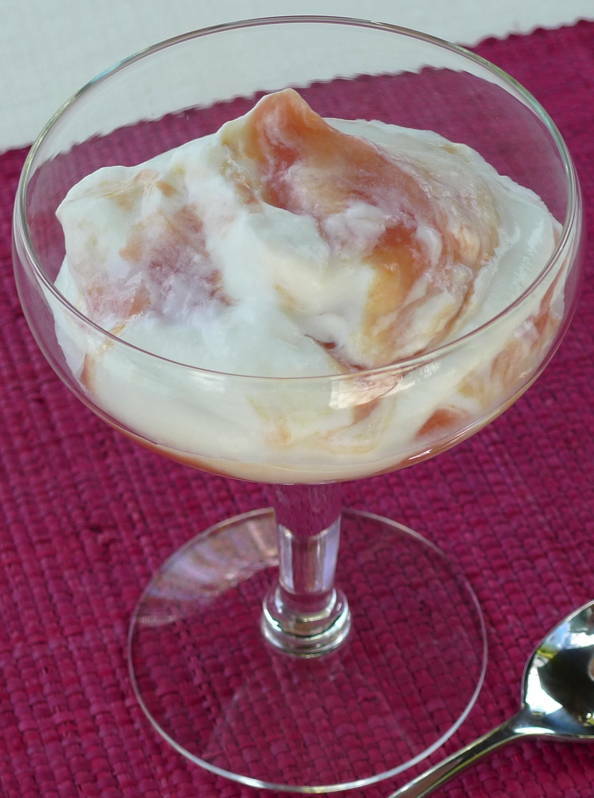 It is typically made with whipped cream or custard, but I cut down on the fat and calories by combining the cream with nonfat plain Greek yogurt. 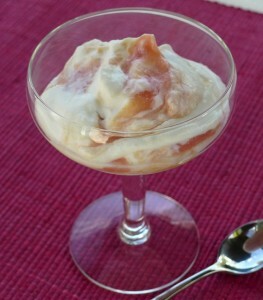 I also boiled the rhubarb with orange juice to sweeten it without a lot of refined sugar. Place the rhubarb, orange juice, orange zest, and sugar in a small saucepan. Bring to a boil, and simmer until the rhubarb is soft. Strain the excess liquid. Purée the rhubarb in a food processor until smooth. Chill. Beat the cream until soft peaks form. Whisk in the Greek yogurt. Then stir the cooled rhubarb mixture into the cream mixture, leaving some streaks. Serve immediately. I hope you have an April Fool’s Day filled with fun and surprising twists and turns! In honor of this fun tradition, I made mini pancakes to celebrate Pancake Day. 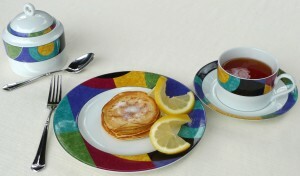 English-style pancakes are much thinner than American pancakes. They are almost like French crêpes. 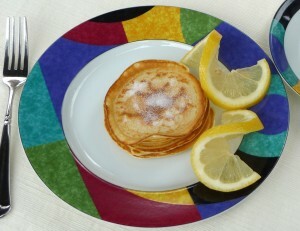 The cakes are traditionally served with a little caster/fine sugar and lemon rather than maple syrup. I chose to make a basic recipe from BBC Good Food. I replaced the plain flour with whole-wheat pastry flour, and I used fully skim milk rather than partly-skimmed milk as the recipe called for. I also made my cakes mini for an afternoon tea snack, but otherwise followed the recipe fairly closely. Blending in the flour: Put the flour and a pinch of salt into a large mixing bowl and make a well in the center. Crack the eggs into the middle, and then pour in about 50ml milk and 1 tbsp oil. Start whisking from the center, gradually drawing the flour into the eggs, milk and oil. Once all the flour is incorporated, beat until you have a smooth, thick paste. Add a little more milk if it is too stiff to beat. Finishing the batter: Add a good splash of milk and whisk to loosen the thick batter. While still whisking, pour in a steady stream of the remaining milk. Continue pouring and whisking until you have a batter that is the consistency of slightly thick single cream. Getting the right thickness: Heat the pan over a moderate heat, and then wipe it with oiled paper towel. Ladle some batter into the pan, tilting the pan to move the mixture around for a thin and even layer. Leave to cook, undisturbed, for about 30 seconds, or until you see the edges getting a bit dry and golden. If the pan is the right temperature, the pancake should turn golden underneath after about 30 seconds and will be ready to turn. Flipping pancakes: Hold the pan handle, ease a fish spatula under the pancake, then quickly lift and flip it over. Make sure the pancake is lying flat against the base of the pan with no folds, and then cook for another 30 seconds before turning out onto a warm plate. Continue with the rest of the batter, serving them as you cook or stack onto a plate. 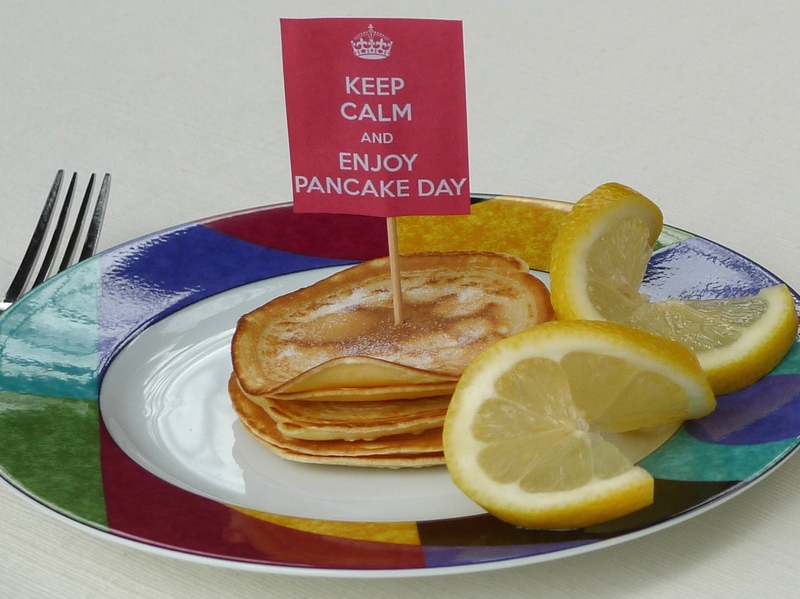 The little flag was generated from the Keep Calm-O-Matic website. You can make your own personalized signs based on the classic British “Keep Calm and Carry On” poster. So fun! This month, I am thoroughly enjoying a cozy mystery that is set in a Charleston, South Carolina tearoom entitled Steeped in Evil. 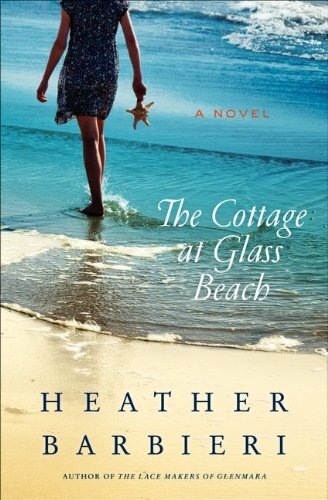 It is such a descriptive book and the characters are so vividly written, that I feel like I am taking a virtual vacation to Charleston! When I find an absorbing book like this, I often get inspired to make a recipe to compliment the story. It’s my way to get a little more into the storyline, and to make it come to life. 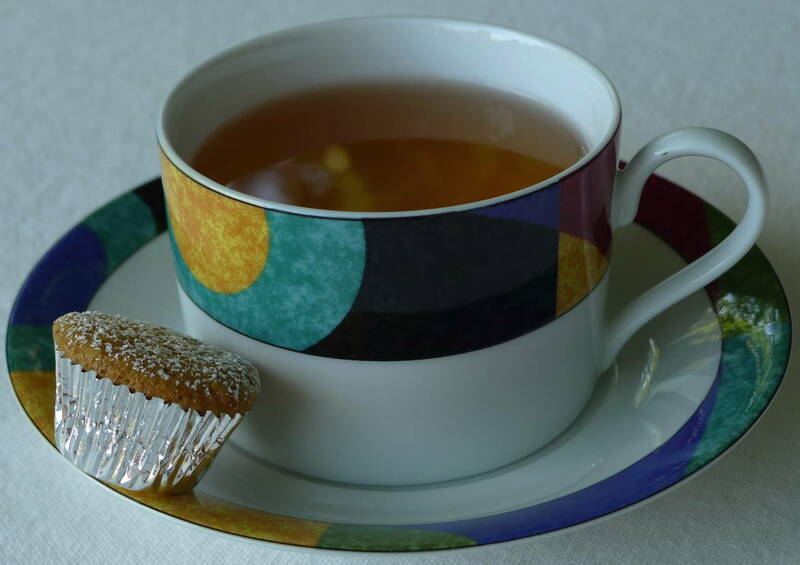 🙂 With this book, I wanted to make something small and sweet that might be served in a tearoom, and I also wanted to incorporate tea within the treat. Chamomile muffins fit the bill! They are perfect to nibble on a lazy and decadent afternoon of reading. I enjoyed some quiet time alone outside on this lovely summer day with a cup of tea, a muffin, and my book. 🙂 I even got out my teapot and poured a glass of bubbly as the fancy teashops do. I felt a little like I was a part of an afternoon tea at the main character’s store, the Indigo Tea Shop. 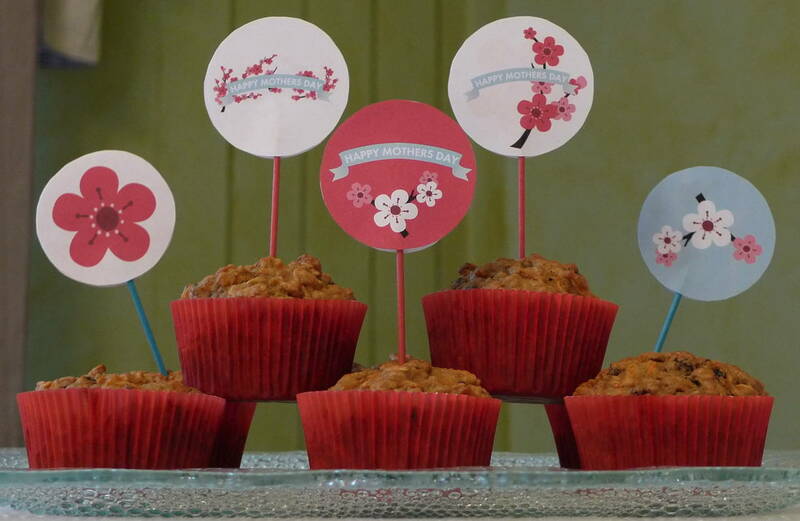 I based these muffins on a recipe from Joy the Baker. I substituted whole-wheat pastry flour for the all-purpose flour, light olive oil for the butter, and I reduced the sugar from the original recipe. The end result was moist, delicate, and delicious! The chamomile flavor really shines through. I didn’t top them with a glaze, but just a light dusting of powdered sugar. To make the cakes: in the bowl of an electric stand mixer fitted with a paddle attachment, mix together oil, flour, sugar, baking powder, baking soda, pinch of salt, and chamomile leaves. Mix on medium speed until the mixture is slightly coarse and sandy. While the mixture beats, in a small bowl, whisk together milk, egg, and vanilla extract. Pour half of the milk mixture into the flour mixture. Beat until just incorporated. Pour in the remaining milk mixture, turn the mixer up to medium-high speed and beat for 1 minute, until well blended. Divide the batter between the prepared cups, filling only half way. Bake the muffins for 17 to 20 minutes for the standard size, 10 to 14 minutes for the mini size, or until a skewer inserted in the center comes out clean. Remove from the oven and allow to cool in the pan for 10 minutes. Remove the muffins from the pan to cool completely before frosting. Cakes will last, well wrapped, at room temperature for up to three days. 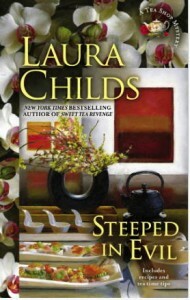 Steeped in Evil is the latest release in the series, but I am looking forward to reading more of the teashop mysteries by Laura Childs. If you are looking for a fun and light summer book, you might enjoy one of these mysteries, too! Almost every Mother’s Day weekend, my mom and I get together for a girls’ weekend to celebrate! We love to spend the time together doing our favorite things like shopping, exploring wineries, and staying up late chatting. 🙂 Given that I am less of a morning person than she is, I made sure she had a bunch of muffins for breakfast when she got up before me. 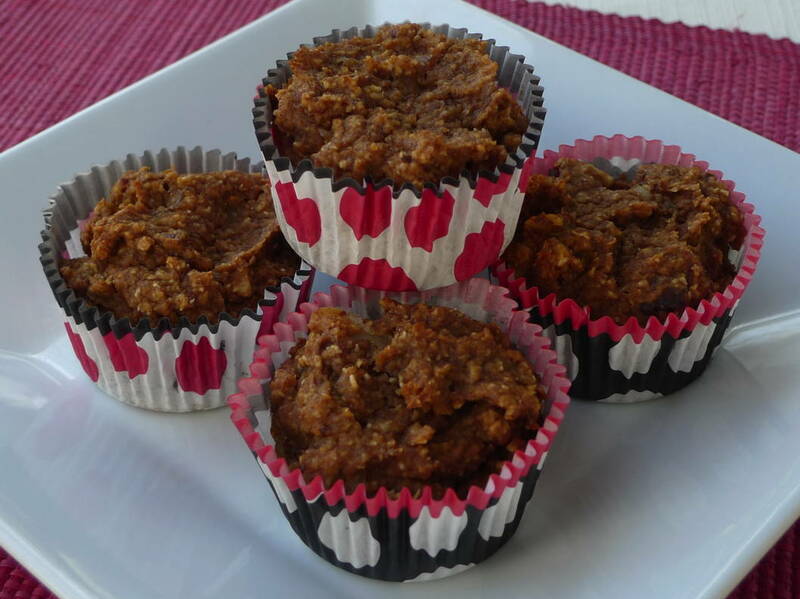 😉 I decided to make these healthy morning muffins this year. I replaced the all-purpose flour with whole-wheat pastry flour, and I also added a tad more skim milk to make sure they stayed moist. I replaced the raisins with currants, since Mom is not a big raisin fan. 😉 I also reduced the salt to a pinch. Preheat oven to 400 degrees. Line a 12-cup muffin pan with cupcake liners. In a large bowl, whisk together flour, brown sugar, baking soda, baking powder, nutmeg, and salt until there are no lumps. Stir in oats and currants. Add oil, egg, milk, carrots, and banana and stir until blended. 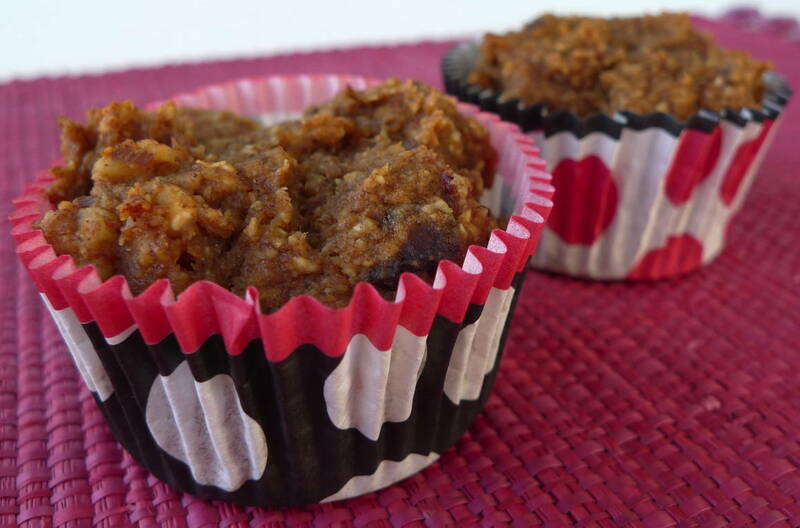 Fill each muffin cup with 1/4 cup batter. Bake until a toothpick inserted in center of a muffin comes out clean, 23 to 25 minutes. 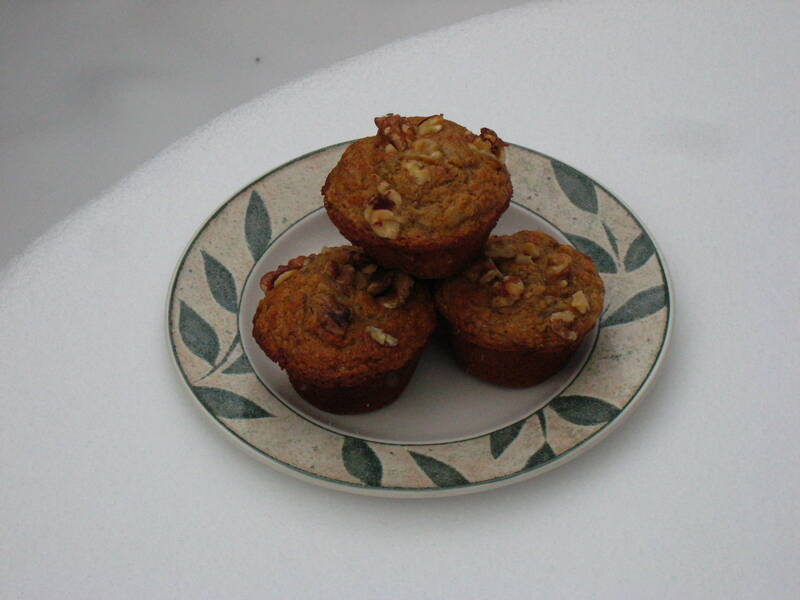 Serve muffins warm or at room temperature. 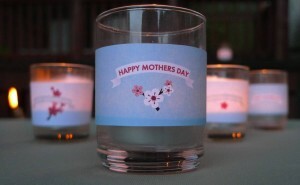 The super cute little decorations are from CatchMyParty.com. They have a large collection of free and printable decorations for all sorts of celebrations, and I would highly recommend checking them out! 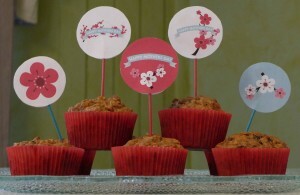 I made cupcake flags and matching votive wraps from the pretty Mother’s Day “Blossoms” design. 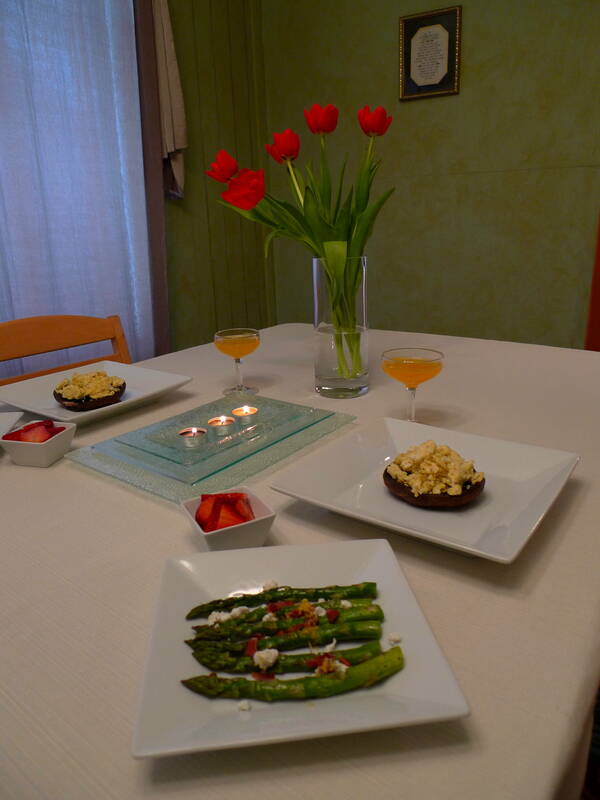 We enjoyed a simple and elegant Easter dinner at home this year. I tried three recipes that were inspired by Sophie Dahl’s cookbook entitled Very Fond of Food: A Year in Recipes. She’s a British cook I recently discovered, and I like her style. 🙂 She has two cookbooks, and she also had a little cooking show on the BBC. For our Easter dinner, we enjoyed bruschetta with an artichoke spread, lobster and crab salad, and this rhubarb rice pudding. I have a sweet tooth, so this was my favorite dish of the evening. 🙂 I love the subtle edition of orange flower water and rose water. It made it a little special and spring-like without being overwhelming. First, make the rice pudding. Pour the milk and rice into a medium sized saucepan, add the cinnamon stick, bring to a boil, and then simmer over very low heat, stirring frequently, for about 15 minutes. At this point, stir in the honey and orange flower water and cook for another 5 to 10 minutes until the pudding is to the consistency that you like. Remove the cinnamon. In a separate heavy bottomed saucepan, combine the rhubarb, water, star anise, rose water, and honey. Bring to a boil and simmer on low for about 10 minutes, turning once or twice, until you have a lovely tender pink softness. Remove the anise. 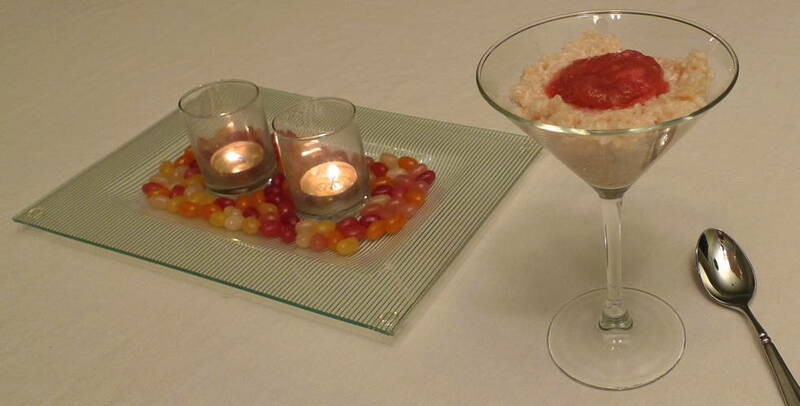 Plate the rice pudding and swirl the rhubarb through. 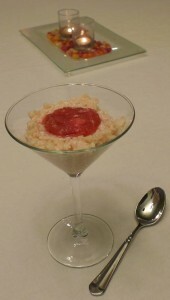 Or, conversely, serve the rice with a small dollop of the rhubarb on the top as I did. STEP 1 Preheat oven to 400 degrees. Line a 12-cup standard muffin tin with paper liners; set aside. In a large bowl, whisk together flours, baking powder, and cinnamon. STEP 2 In a separate bowl, whisk together eggs, brown sugar, yogurt, and Earth Balance. Make a well in the center of flour mixture. Add egg mixture to well, and mix in flour mixture until just combined. Gently fold in the granola and pears. Make Granola Crisp Topping: In a bowl, toss together 1/2 cup granola, and 1/4 cup each all-purpose flour and packed light-brown sugar. Cut 3 tablespoons chilled Earth Balance into pieces; add to granola mixture, and rub in with fingertips until clumps form. STEP 4 Divide batter evenly among lined cups, filling each 3/4 full. Sprinkle with granola topping. 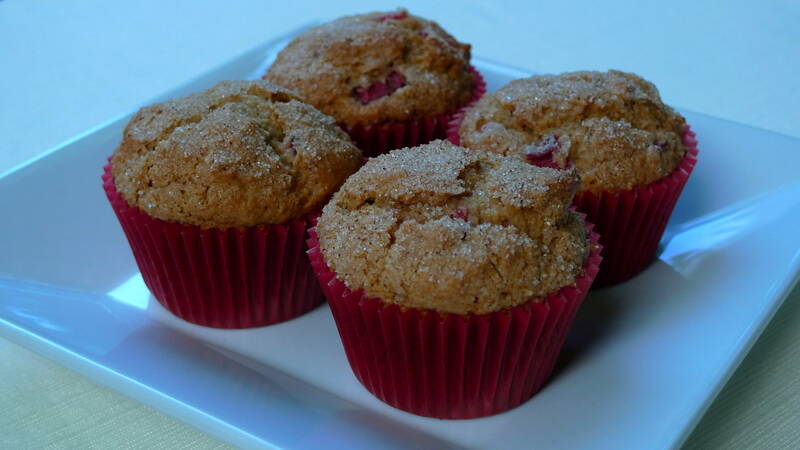 Bake until a toothpick inserted in the center of a muffin comes out clean, about 20 minutes. Cool 5 minutes before removing from tin. Serve warm or at room temperature. I am enjoying a summery book named The Cottage at Glass Beach by a local Seattle author, Heather Barbieri. I discovered the book on a fun little book and food website called Books and Bites. I’ve been choosing a lot of my recent book selections from the recommendations on that site. Not only do I get many good book suggestions from other authors I enjoy, but I also get a recipe that fits the theme of every book. So fun! Combine the brown sugar, oil, egg, vanilla and buttermilk in a mixer bowl, and beat until well incorporated. Stir in the rhubarb by hand. In a separate bowl, combine the flour, baking soda, baking powder and salt. 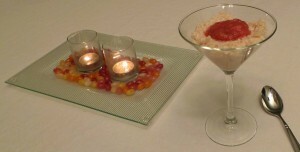 Stir into the rhubarb mixture until just blended. Spoon the batter into a muffin tin filled with paper linings, about 2/3 full. For the topping, combine the granulated sugar and cinnamon, and sprinkle evenly over the muffins. Bake at 400 degrees for 20-25 minutes, or until a toothpick comes out clean when inserted into the center of a muffin. Preheat oven to 250°F. Place baking sheet in oven. Whisk first 4 ingredients in large bowl. Whisk milk, eggs, and vanilla in medium bowl, then whisk in coconut oil. (It will clump a little when it hits to cool milk, but it will melt again in the pan when cooked.) Stir milk mixture into dry ingredients. Stir in chopped macadamias if using. Heat large nonstick griddle or skillet over medium heat. For each pancake, drop 1/4 cup batter onto griddle. 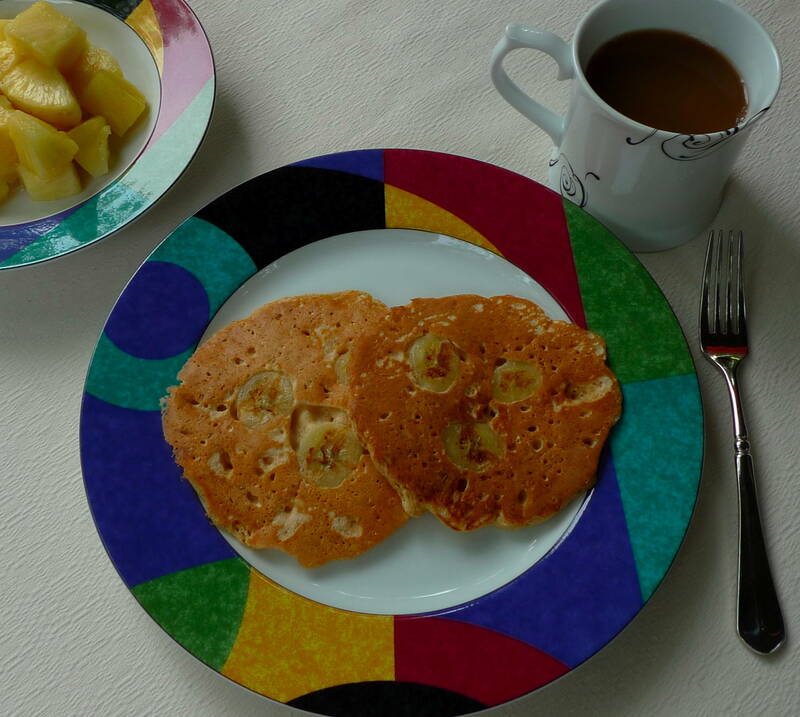 Arrange 3 banana rounds on each pancake. Cook until brown, about 2 minutes per side. Transfer to baking sheet in oven. 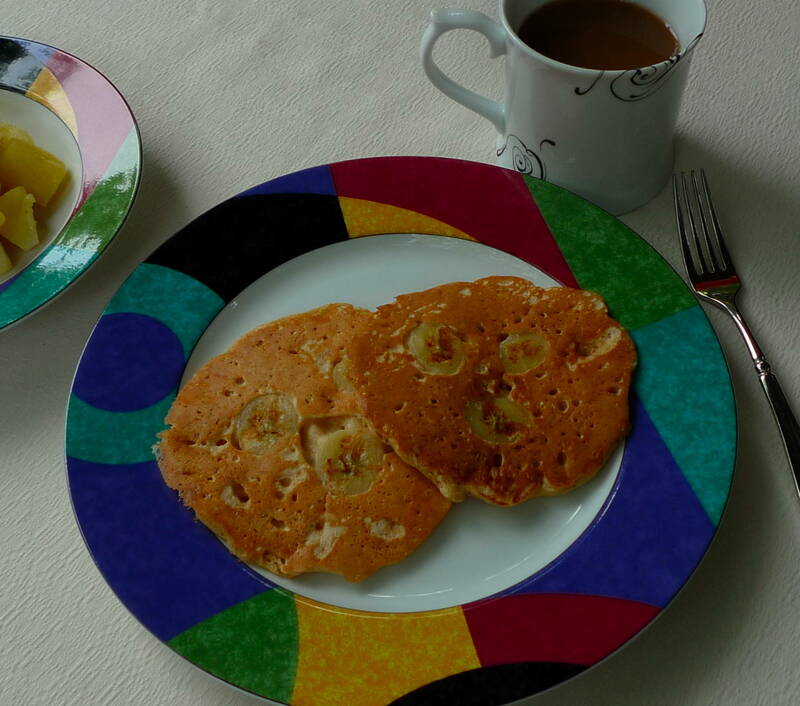 Repeat with remaining batter and bananas. Serve with syrup. I recently discovered all natural syrup that we have been using on our pancakes at my house called Sohgave! vanilla maple flavor agave syrup. I don’t like buying the artificial sugar free syrups, so this is a nice alternative if you’d like something other than maple syrup. Very yummy, and it doesn’t leave you with a sugar high like maple syrup can sometimes do. Whisk sugar and cardamom in small bowl to blend. Pour Grand Marnier into large bowl. 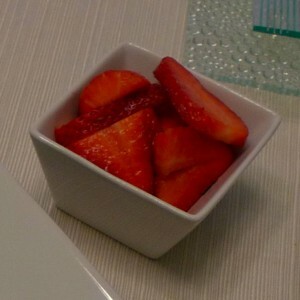 Add strawberries to bowl and toss to coat. 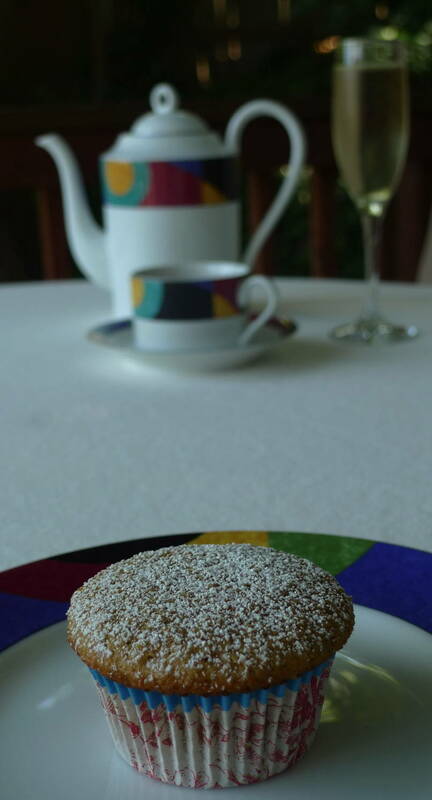 Sprinkle to taste with cardamom sugar. Serve. We made a Broiled Portobello Topped With Creamy Scrambled Eggs as the main course of our spring anniversary brunch. 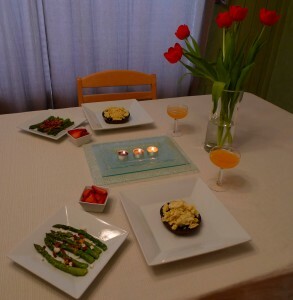 We often make a scramble on a regular Sunday morning, and this was only minimally more effort. We usually lighten our scrambles by using about half of the egg yolks to egg whites, and we did the same here. I also omitted the butter from the original recipe completely and just used a non-stick pan with no oil for the eggs. I would recommend measuring both the Parmesan and the rosemary to taste. We used a little more cheese than the recipe called for, but we used less rosemary. (I will make exceptions when I think the fat is worth it…Cheese is worth it to me!) Make it your own, the way you like it :). Whisk eggs, Parmesan cheese, chopped rosemary, salt, and pepper in large bowl to blend. Heat large non-stick skillet over medium-low heat. Add eggs to skillet and stir gently in circular motion with wooden spoon or heat-resistant rubber spatula, releasing cooked eggs from bottom of skillet and allowing uncooked portion of eggs to flow underneath. Cook until eggs are set but still soft, about 4 minutes total. 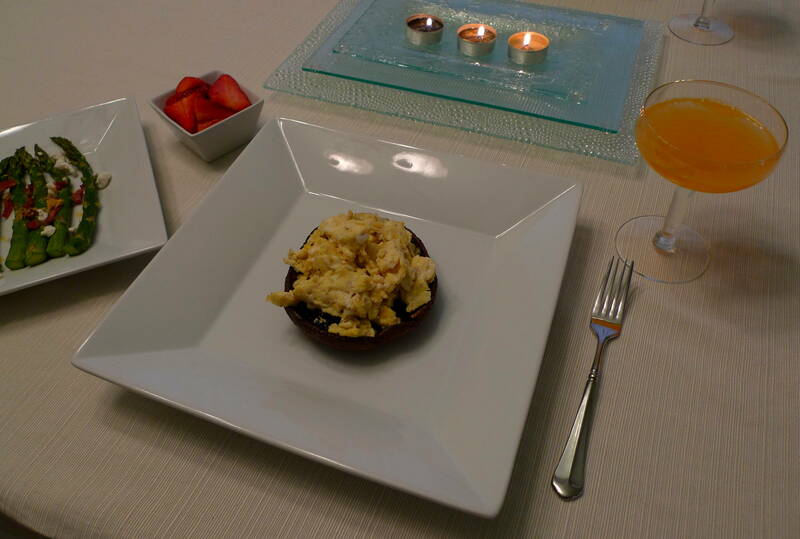 Arrange hot portobello mushrooms, gill side up, on plates. Top with eggs, dividing equally. Sprinkle with more grated Parmesan cheese, dividing equally, and serve. This year we made a nice brunch at home. 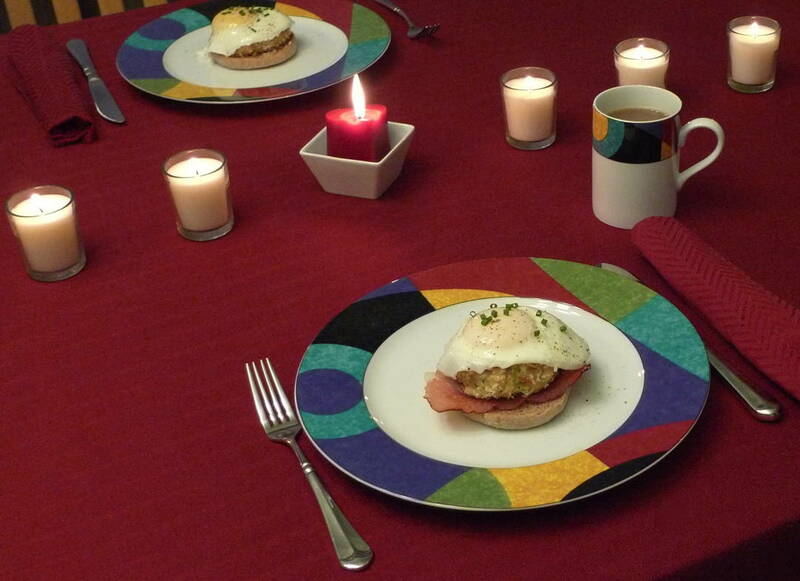 The first meal of the day to celebrate the beginning of us :). I found a menu from Bon Appétit magazine that was both simple and elegant. We made three of the dishes, and we thought they all turned out really well. They would be perfect for Easter, or Mother’s Day, or any other spring celebration. I will definitely keep these recipes at the front of my list when I need a special, but quick, brunch recipe. I am rarely up for a big cooking project first thing in the morning ;-). 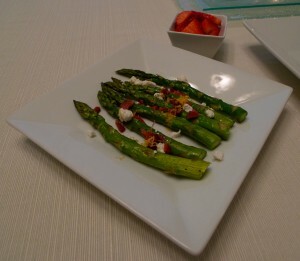 First we made Roasted Asparagus with Goat Cheese and Crispy Prosciutto. It was a fresh and light dish. Prosciutto can be fried in a dry, non-stick sauté pan until it gets crispy just like bacon, which is a little healthier option than traditional bacon. I also didn’t drizzle olive oil over the asparagus at the end, as the original recipe called for, to keep the dish a little bit lighter. Other than that, I followed this recipe pretty closely. Just be sure to keep a close eye on the asparagus in the oven so it doesn’t over cook. Cook prosciutto in large non-stick skillet over medium heat until brown and crisp. Transfer to paper towels and drain. Crumble prosciutto; set aside. Position rack in center of oven and preheat to 500°F. Arrange asparagus on large rimmed baking sheet. Drizzle with 2 tablespoons oil and turn asparagus to coat well. Sprinkle generously with salt and pepper. Roast asparagus until crisp-tender when pierced with knife, about 7 minutes. Julia Child would have turned 100 years old today. That milestone has inspired cooks everywhere to remember her and to cook something a little French this evening :). Sur La Table is hosting cooking classes this month to celebrate her birthday including 4 of Julia’s recipes. 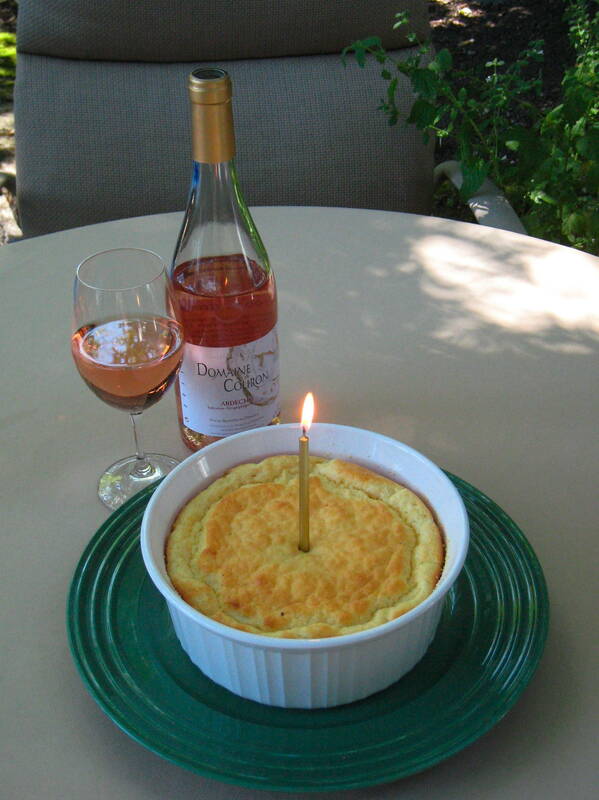 I recreated my favorite of the 4 at home ~ The cheese soufflé. The original is published in The Way to Cook, and Bon Appétit magazine also published an adaptation of the recipe a few years ago. Position rack in lower third of oven and preheat to 400 F.
Grease 6-cup (1 1/2-quart) soufflé dish with Earth Balance. Add Parmesan cheese and tilt dish, coating bottom and sides. Meanwhile, melt Earth Balance in heavy large saucepan over medium heat. Add flour and whisk until mixture begins to foam and loses raw taste, about 3 minutes (do not allow mixture to brown). Remove saucepan from heat; let stand 1 minute. Pour in warm milk, whisking until smooth. Return to heat and cook, whisking constantly until very thick, 2 to 3 minutes. Remove from heat; whisk in paprika, salt, pepper, and nutmeg. Add egg yolks 1 at a time, whisking to blend after each addition. Scrape soufflé base into large bowl. Cool to lukewarm. DO AHEAD: Can be made 2 hours ahead. Cover and let stand at room temperature. Using electric mixer, beat egg whites in another large bowl until stiff but not dry. 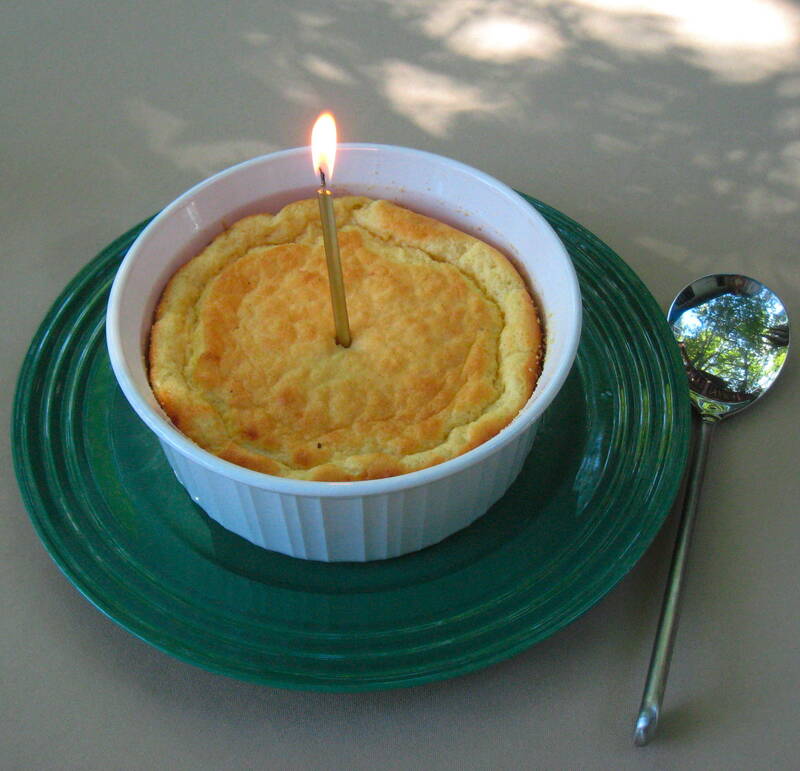 Fold 1/4 of whites into lukewarm or room temperature soufflé base to lighten. Fold in remaining whites in 2 additions while gradually sprinkling in Gruyère cheese. Transfer batter to prepared dish. Place dish in oven and immediately reduce oven temperature to 375_F. Bake until soufflé is puffed and golden brown on top and center moves only slightly when dish is shaken gently, about 25 minutes (do not open oven door during first 20 minutes). Serve immediately. This pairs well with a summery rosé wine. French of course ;-). Our house rosé at the moment is Domaine Couron Grenache Rosé from France, which was perfect. Seattle woke up to quite a bit of snow today, which is a rare treat for us! It is so gorgeous and white outside of my window. 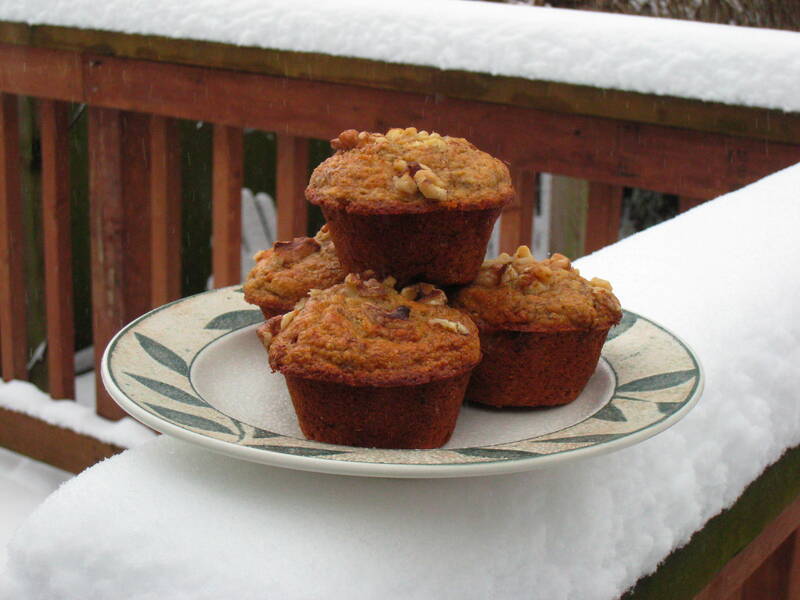 The snow inspired me to bake some muffins to warm up our kitchen and make the house cozy :). 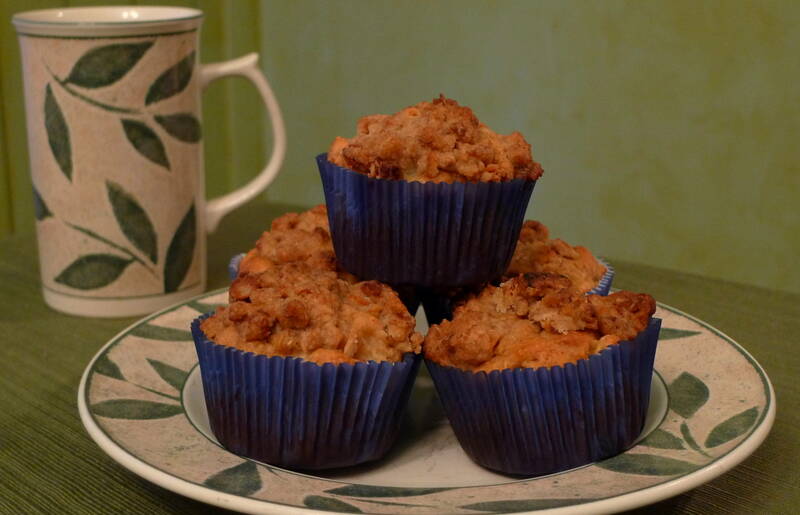 After several batches, these banana buttermilk muffins were our favorite. I used all whole-wheat pastry flour instead of mixing it with all-purpose flour. 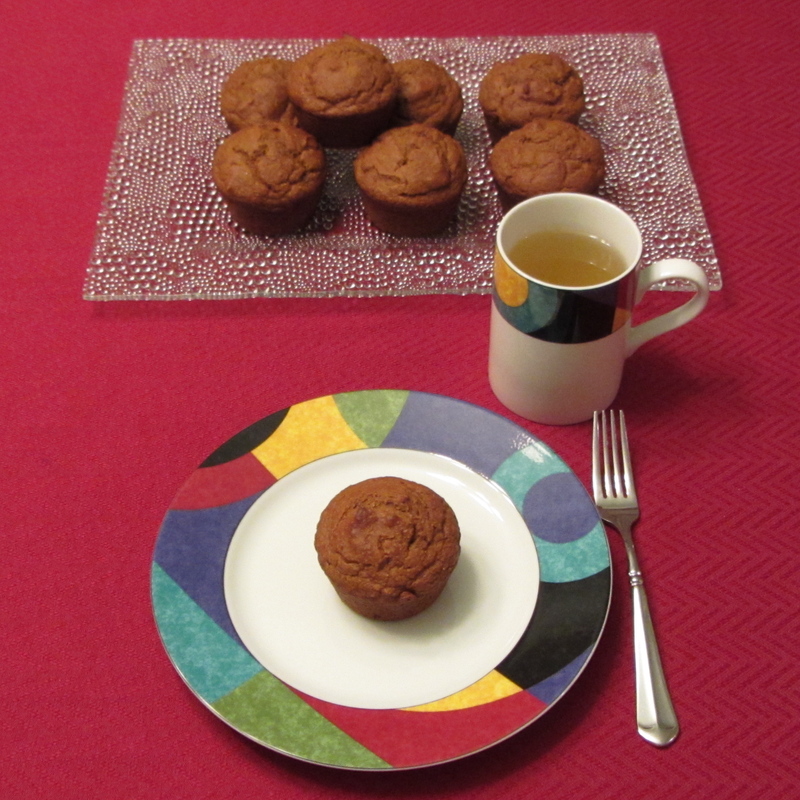 I think banana muffins can stand up well to the nuttier flavor of whole-wheat flour. Other than that, I followed the recipe pretty closely. They are tender from the buttermilk and nice and sweet from the ripe bananas I pulled out of our freezer. It will definitely be a good one to go with our morning coffee even after the snow melts :). In a large bowl, stir together the flour, sugar, baking powder and baking soda. In another bowl or a large, glass measuring pitcher, whisk together the buttermilk, banana, oil, egg and vanilla. Pour the wet ingredients over the dry ingredients and stir just until blended. Do not over mix. Spoon the batter into the prepared muffin cups, filling each about three-fourths full. Sprinkle the tops evenly with the walnuts. Bake the muffins until they are lightly browned and a toothpick inserted in the center of a muffin comes out clean, 15 to 20 minutes. Let cool in the pan on a wire rack for 15 minutes, then turn out onto the rack and let cool completely. The muffins will keep in a zippered plastic bag at room temperature for 2 or 3 days, or in the freezer for up to 2 months. Makes 12 muffins. I have tried many pumpkin muffin recipes since pumpkin is one of my favorite fall flavors, but this is the one I keep coming back to. 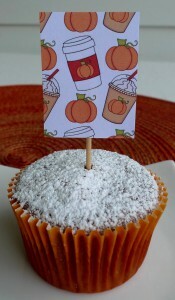 They are now an autumn/holiday treat that I make every year. 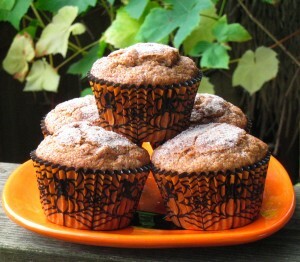 (Sometimes I even make them in the spring or summer since they are so good, and canned pumpkin is available year round!) I follow the original recipe pretty closely, except I use 100% whole-wheat pastry flour instead of any white flour. 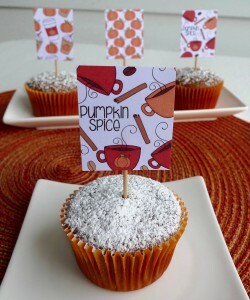 I think the spices and the pumpkin combine well with the nuttier flavors in the whole grain flour. I hope you’ll give these a try! They are definitely a favorite at our house :). Preheat oven to 400 degrees F. Coat a 12-cup muffin pan with cooking spray. In a medium bowl, whisk together the flour, baking soda, salt, cinnamon, ginger, cloves, and nutmeg. In a large bowl, whisk the sugar, molasses, oil and 1 egg until combined. Add the other egg and whisk well. Whisk in the pumpkin and vanilla. Whisk in the flour mixture in 2 batches, alternating with the buttermilk. Whisk just until combined. Pour the batter into the prepared muffin pan. Tap the pan on the counter a few times to remove any air bubbles. 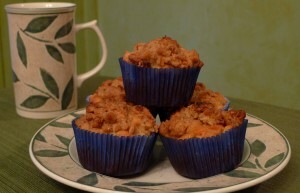 Bake for 20 minutes or until a wooden pick inserted in center of 1 of the muffins comes out clean. PS. If you don’t have buttermilk on hand, reduced fat sour cream can be a good substitute. I made a couple of batches of applesauce spice muffins to warm up the house on chilly October days. 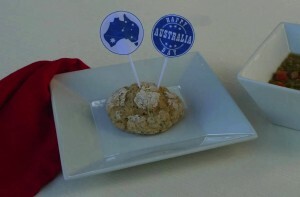 The original recipe was from Gourmet magazine, and it can be found at Epicurious.com. I used a few tricks to make these treats a little healthier, though ;). I substituted whole-wheat pastry flour for the all-purpose flour, I reduced the sugar a little and I replaced the butter with a blend of canola oil and light sour cream. Put your oven rack in the middle position and preheat to 400 degrees. Grease the muffin pan or line it with cupcake papers. Stir together the flour, baking powder, baking soda, spices, and salt in a medium bowl. In a large bowl, whisk together the eggs and brown sugar, then whisk in the canola oil and sour cream until well combined. Stir in the applesauce. Add the flour mixture to the wet mixture until the flour is just moistened. Stir in the nuts at this point if you are using them. Divide the batter between 12 muffin cups. For the topping, stir together all of the topping ingredients with the almonds if you are using them. Sprinkle evenly over the muffins. Bake until the muffins are puffed and golden, about 20 minutes. A wooden skewer inserted should come out clean.